The SunPlus Network is a joint effort of a large array of people, organizations and joint efforts that work towards the Networks’ Mission Statement. As a Network they are non-hierarchical where each element is encouraged to work with any other element to advance the Network’s Mission Statement. The Infor Corporation is the software corporation from whom we purchase the accounting software. The main contribution of the Infor Corporation is to provide professional consulting expertise, and top tier support to the rest of the Network. The SunSystems Corporation is the Division of Infor that designs and delivers the specific accounting Software the Network is using. World leader in business management solutions. See the graphics below. 140 Programmers assigned solely to our accounting package. Another important element in the SunPlus Network is Division Leadership. There has been a wide difference in the responses of Division Leadership in regards to the SunPlus project. In a sense only 4 divisions do not see themselves as part of the SunPlus network. Different parts of the world have responded differently to the SunPlus Network. Many factors cause the differences such as accounting industry practices and the relationship of the Division to the world church. These support workers provide first line 24/6 support to end users who are having trouble. In addition they are providing support to Division implementation teams by assisting either remotely or on site with new organizations. They also provide Network wide IT support to particular SunPlus IT initiatives. Approximately one-half are accountants and the other half are IT specialist. Both halves are receiving training and are providing some help on the other specialty. The strategy with this is to identify and hire skillful workers who understand the software and the SunPlus Network. Then to leave them in their home country, but grouping them as far as possible in centers to provide ease of supervision and mutual fellowship. Training is emerging as a top priority of the SunPlus Network. In the distant past the focus was on preparing written documents that covered primarily the core functionality of the SunSystems software. More recently the focus has shifted in two dimensions. The first was to focus on a broader range of topics including software functionality that was beyond the functionality that is obviously needed by the users. This allows for creativity on the part of the users to use the software in a fashion that meets their needs and allows a greater sense of ownership in the software. GC Team Member, Janalee Shaw, directs the efforts in this regard. 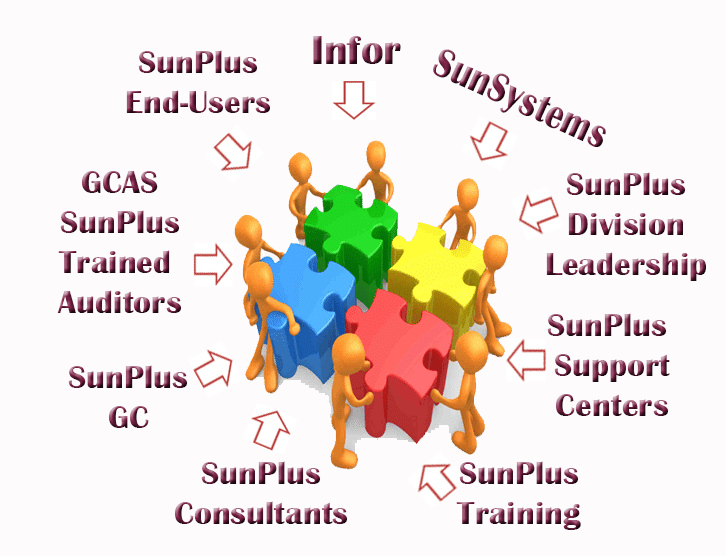 The initial vision of the SunPlus project included the idea that global auditing would be enhanced by having standard accounting software. However, fairly early in the development of the SunPlus project tensions between GCAS and the SunPlus project developed. There were several reasons for this. There was initially a failure in the implementation of the software to fully meet all of the accounting needs of the organization. These shortfalls were real and have long ago been remedied as seen by the dramatic fall in qualified opinions given with the financial statements for users of the SunPlus software. Prior to the SunPlus program, auditors were the sole authorities when it came to accounting rules in the church. The SunPlus project added another voice to the conversation, which in some cases was unwelcome. The SunSystem’s software configures data in a novel and innovative way. This is a very useful innovation. However, as a failure in both SunPlus and GCAS, the auditors were not exposed to this before they encountered it in the field. So since they did not understand how data was organized, their initial reaction to it was negative. Each of these things have been addressed by training, the accounting manual and many positive audit outcomes. And now the GCAS Auditors and the rest of the SunPlus Network work in a very agreeable fashion. The last group of the network is by far the most important. The network interplays of the end users attest to the value of having a uniform software solution. With a uniform solution an end user can progress professionally through the denomination, taking progressively more responsibility, by seamlessly moving from organization to organization. At each organization they encounter the Standard Chart of Accounts, standard Software and Standard operating processes. Moreover, the users at say a Conference office can walk next door to an ADRA office or school to assist them with a challenge. For example, they can help solve software problems, fill in for maternity leave, or help catch up on a backlog of accounting tasks. Also end users can support each other via our Yammer Social site where users can exchange ideas and problems. This user-to-user support is vital in that it extends beyond the technical mutual accounting support or the mutual software support. Where the real value to the denomination arises is where the accountant sees the work beyond their local organization and identifies also with the world wide denomination. This is particularly valuable where an organization or its leadership may be troubled. The worker in that difficult environment can get emotional support and guidance from others in the network. And even more practical if they are inclined to jump ship on their particular organization, their training, experience, and network contacts makes it more likely they will land with another Adventist organization rather than with a nonAdventist organization. This networking of workers on a technical and emotional level is by far the most important contribution SunPlus makes to the denomination. SunPlus is a financial management and accounting software package with strong analytical tools designed for use in the majority of the administrative and institutional organizations of the Seventh-day Adventist Church worldwide. It is commercially known as Infor SunSystems.